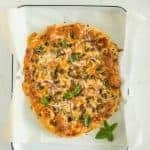 Homemade supreme pizza recipe made from homemade pizza dough, cheese, sausage, pepperoni, mushrooms, peppers, onions, and more. There are a few skills that I feel are essential for being a good mom. Making homemade pizza is one of them. I don’t know why, but being able to make a mean pizza is important to me! We make homemade pizza almost every Friday night and this supreme pizza is one that we make over and over again. 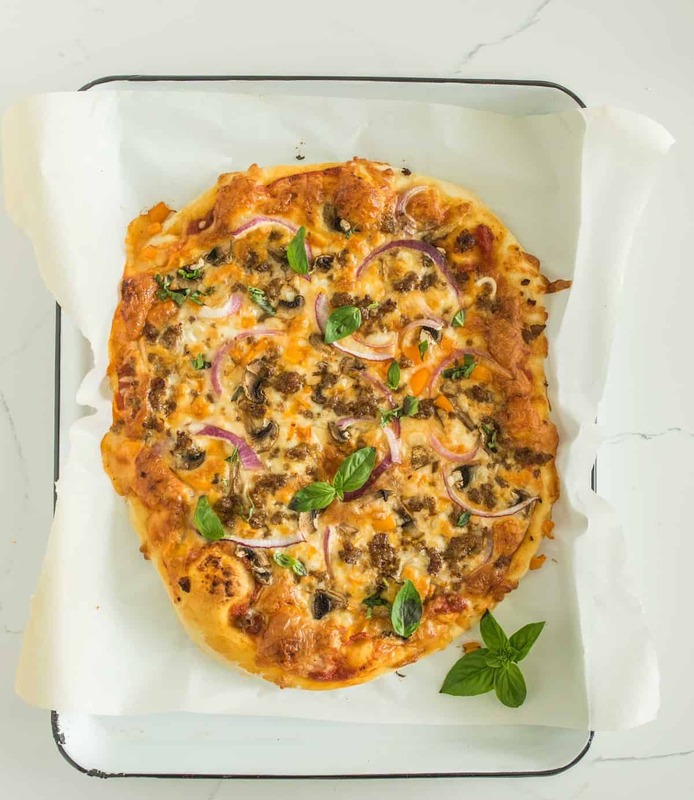 For this recipe, I have also included my favorite pizza baking method (because those two things go together). It’s very pizzeria in style. The dough is a medium thickness, the bottom gets nice and brown, and the cheese around the edge gets crusty, edging on burnt. Mmmm…that crusty dark cheese! Don’t be tempted to overload on cheese and toppings. With pizza, more is not always better. The crust won’t cook through if you get too crazy, and very few things are grosser than doughy pizza. 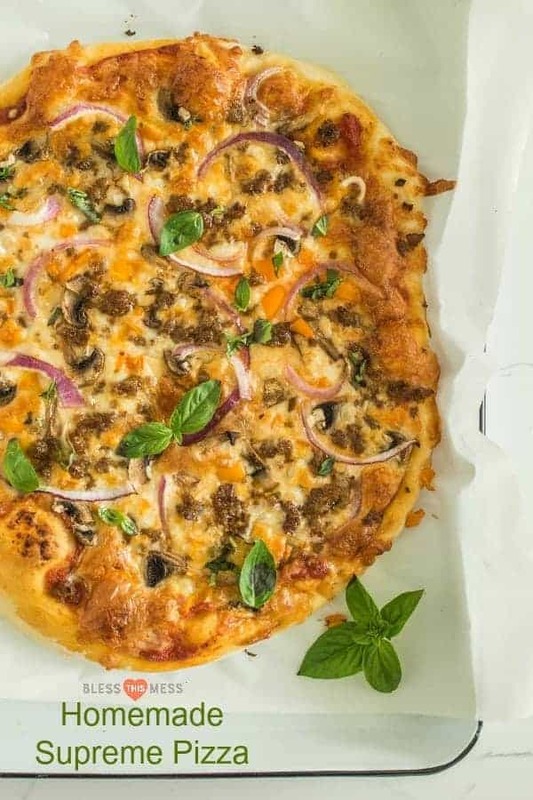 What is the best homemade pizza sauce to go with this pizza recipe? 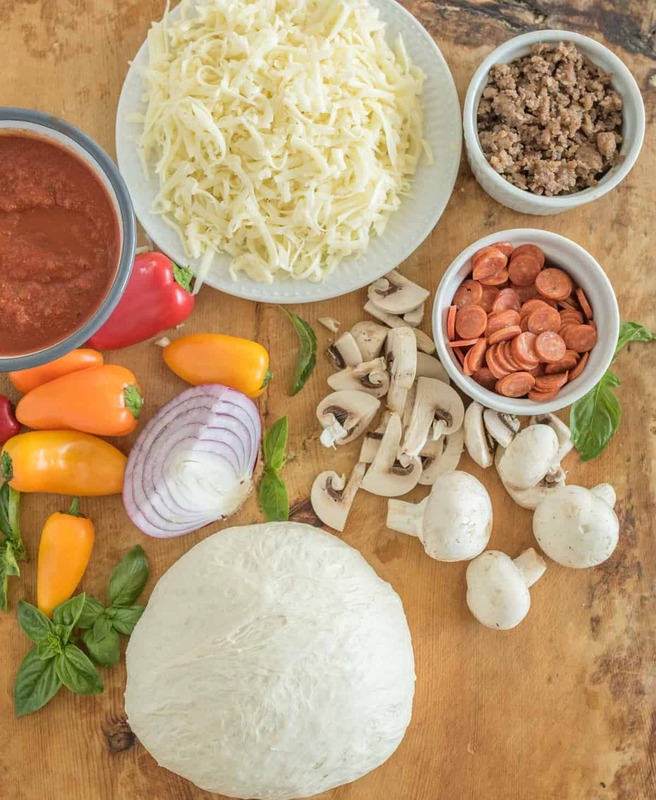 Looking for the best (and easiest) pizza sauce recipe? You’ll need 2 tablespoons olive oil, 2 cloves garlic, and 1 (28-ounce) can crushed tomatoes. In a small sauce pan, cook the oil and garlic together over medium heat until the garlic starts to smell good. Add the tomatoes and simmer until it thickens a bit, about 15 minutes. Season with salt and pepper to taste. DONE! Really. Three ingredients and it tastes amazing! How do you know if yeast is still good? Fill up a small measuring cup with a little warm water. Add 1/4 teaspoon of your yeast and then add a pinch of sugar and lightly stir it together. Wait for 5 minutes. If the yeast is still active, you will see little bubbles along the top of the water and it will start to “foam”. I think the date on the yeast package is a good guide, and I like to store my yeast in the fridge to help keep it fresh. When in doubt, get new yeast. If you like something else on your pizza, add it! Don’t like one of these toppings, skip it! The idea is just to add a little of a few things and not too much of all of them. The crust won’t bake if it’s topped too heavily. The perk of making pizza at home – you can customize it how you like. No time to make pizza dough? Pick up some dough from your local pizza shop or from the deli of a well-stocked grocery store. Both are great and generally inexpensive options. Looking to cut down hands-on time? You can prep the sausage and veggies ahead of time and store them in the fridge a few days until you are ready to make your pizza. Lots of times I’ll pick recipes that have similar ingredients and prep them all one day and use them through the week. These ingredients also work great in pasta sauce and in egg bakes or omelets. Chop once and cook all week. I just started buying precut parchment paper sheets and they are so convenient. They don’t roll and curl up like the rolls I normally buy to just cut off a piece. I recommend the precuts! Craving more? Subscribe to Bless this Mess to get new recipes, meal plans, and a newsletter delivered straight to your inbox! If you try this recipe, let me know what you think! Leave a comment, pin it, and don’t forget to tag a picture #blessthismesseats on Instagram. I love to see your kitchen skills in action! In a large mixing bowl, add the water, yeast, sugar, salt, and olive oil. Allow mixture to stand for 5 minutes. Add one cup of flour, and mix to combine. Mix by hand for 1 or 2 minutes. The dough should be the consistency of cake batter. Add another cup of flour and mix until well combined. Add flour in small increments until you can’t mix it by hand very well. Sprinkle some flour on your table and turn the dough onto the table. Knead the dough by hand until it is smooth and elastic, adding flour as needed. This should take 6 to 10 minutes of kneading. You can also do this part in a stand mixer if you have one. Place the dough back in the bowl, cover it with a towel, and let it rise in a warm place for 15 to 60 minutes (This time varies a lot for me – I just let it rise according to how long it is until dinnertime). While the dough is rising, preheat your oven to 500 degrees. If you have a baking stone, put it in the oven to heat, too. I would recommend using a stone for baking this pizza. If you don’t have a stone, you can turn your biggest cookie sheet upside down (so that the flat side is up) or use a rimless sheet. If you are using a stone let the stone heat for 30 minutes. If using a baking sheet, let it heat for 10 minutes. When the oven is hot, turn your dough out onto a piece of parchment paper. Using a rolling pin, roll the dough (on top of the parchment paper) into a 12 to 14 inch circle. The dough should be about a half-inch thick. Top with pizza sauce and then the shredded mozzarella. Add the peppers, onions, mushroom, sausage, and pepperoni. 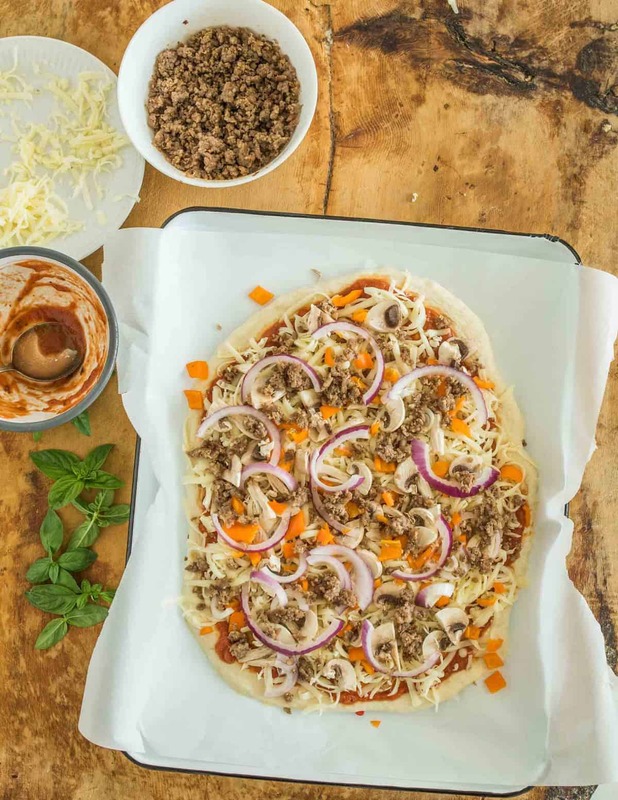 When the pizza is assembled, slide the pizza, which is on the parchment paper, onto a rimless cookie sheet or one that is upside down. This will help you get the pizza to the oven. 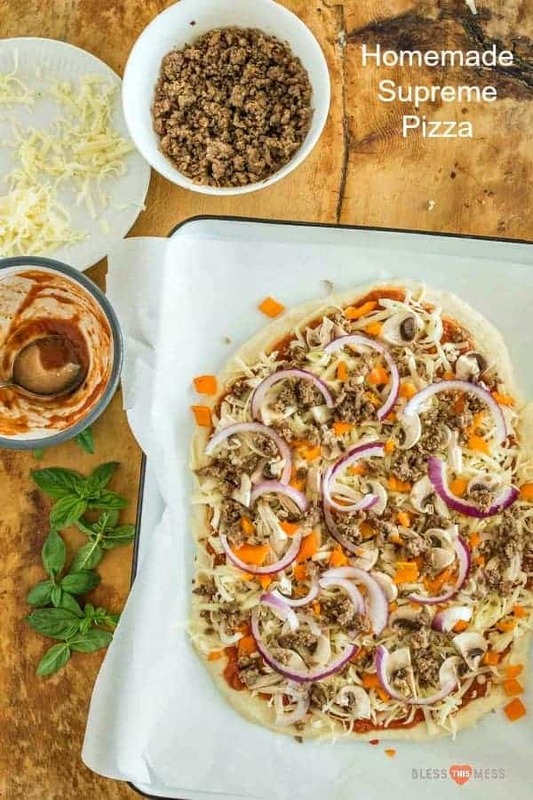 Open the oven and slide the pizza which is still on the parchment paper, from the cookie sheet onto the hot baking stone or hot cookie sheet. I just tug on the edge of the parchment paper with my hands and slide it onto the stone. BE CAREFUL! Your oven is set to 500. It’s super hot, obviously! Make sure the babies are out of the way and be careful when sliding the pizza into the oven. Bake for 10 to 15 minutes until the top is bubbly and the edges are starting to brown. When the pizza is done, tug the edge of the parchment paper and slide the pizza back onto the cookie sheet you used to transfer it to the oven. Again, be careful! Let the pizza rest for 5 minutes before cutting and serving hot. If you like something else on your pizza, add it! Don’t like one of these toppings? Skip it! The idea is just to add a little of a few things and not too much of all of them. The crust won’t bake if it’s topped too heavily. The perk of making pizza at home, you can customize it how you like. Looking to cut down hands-on time? You can prep the sausage and veggies ahead of time and store them in the fridge a few days until you are ready to make your pizza. Fruit Pizza Cookies and a Trip to the Farm! Those aren’t the only pizza recipes I have! I have all kinds hiding in my archives, just search pizza to see them all. I hope this supreme pizza gets you excited for your own Friday night pizza-making session. It’s a great recipe to get in the kitchen with your kids. An activity that you can eat at the end – sign me up! This pizza looks so good! All of my favorite toppings – Supreme is the best! I’m Melissa, and I want to help you feed your family wholesome food. As a hobby farmer and mom of five, I’m all about keeping it simple in the kitchen. I want healthy meals that feed my family well, and then I want to get back to my (messy) life. Let’s work together to find something yummy for your dinner table.